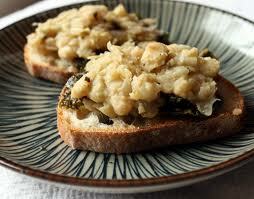 Puree beans in food processor or with hand held blender with sage and olive oil, salt to taste. Smooth a spoonful of bean puree on the bruschetta. Top with shredded arugula and roasted red peppers. Grind a bit of black pepper on top and serve immediately. If you keep a jar of red pimentos in the pantry along with can of cannellini beans – all you need is a loaf of good bread for a quick and easy appetizer. 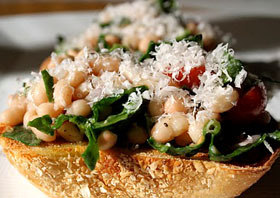 This entry was posted in Appetizers, Fan Favorites, Italian Restaurant and tagged Bruschetta, tuscan, white bean. Bookmark the permalink.